Get the Smile of Your Dreams with Porcelain Veneers in Plano! When you look into the mirror, are you happy with the way your smile looks? Do you have minor imperfections in your teeth like gaps, crookedness, misalignments or stains? If any of this applies to you, then your local dentist says you could benefit from porcelain veneers in Plano. As you read on, he’ll explain what they are and how they can rejuvenate your smile! Veneers are thin shells that are custom-made from ceramic material. They provide the ultimate in convenience by fitting right over your existing teeth and overhauling the image of the ivories in the smile zone. Numbing – Your dentist will first apply a topical anesthesia to numb your mouth before the procedure starts. The Final Visit – Once your veneers are ready, your local professional will have you come back in for your final visit, where your permanent fixtures will be placed. When you leave your dentist’s office, you will look and feel like a brand-new person, as you smile with confidence! 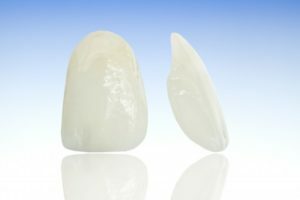 Who’s the Right Person for Porcelain Veneers? The porcelain veneers process is highly successful and popular among patients, but their longevity greatly depends on how you care for them. No Tobacco – He or she won’t chew or smoke tobacco, because it will only ruin the beautiful new veneers and stain the other teeth. Oral Hygiene – A good candidate for veneers is someone who practices excellent oral hygiene, which includes toothbrushing and flossing to remove harmful bacteria and debris that could compromise a beautiful smile. Early Whitening – The person who gets his or her teeth whitened before getting porcelain veneers is definitely a good candidate. The reason that whitening needs to be done prior to getting veneers is that it causes immature wear and discoloration. Furthermore, there should never be a need to whiten veneers because they are highly stain-resistant. Now that you’re equipped with the information that you need, you can make an informed decision. The process for getting smile perfection with porcelain veneers is simple, so reach out to your cosmetic dentist in Plano to schedule your first appointment. Smile perfection is just a visit away! A graduate of the Texas A&M College of Dentistry, Dr. Afshin Azmoodeh has been practicing dentistry for nearly 20 years. He’s still driven by the same passion for helping people that he had when he first entered the field, which is why he was nominated as one of “America’s Best Dentists” for two years in a row. Dr. Azmoodeh practices at Legacy Trails Dental and can be reached for more information through his website. Comments Off on Get the Smile of Your Dreams with Porcelain Veneers in Plano!